Intensive care units, such as that in the NIH Clinical enter, treat such patients, study mechanisms of sepsis and develop improved treatment (and prevention). Tuberculosis is one of the top 10 causes of death globally and the leading killer of people with HIV. Once thought to be under our control, the ancient plague has staged a global resurgence with worrisome strains of multidrug-resistant TB. In 2017, 10 million people fell ill with TB, and 1.6 million died from the disease, many as a result of these new strains, according to the World Health Organization. For this next lecture in the Demystifying Medicine series, we bring you to the two frontlines of the TB battle. Ray Chen is a staff clinician in the NIAID Tuberculosis Research Section (TBRS). From 2004 to 2012, Chen was stationed in China administering NIAID's research and intervention projects for TB as well as HIV and influenza. China has an estimated one million new cases of TB every year. With help from NIAID, WHO, and China authorities, Chen witnessed a drop in the prevalence rate by 4.7% per year over the first decade of the 21st century. Nevertheless, the WHO estimates that there are 63,000 new multidrug-resistant TB infections annually in China, and much more work needs to be done. Meanwhile, back at the NIH, NIAID TBRS Chief Clifton Barry commands a multidisciplinary group of research scientists comprising biologists, chemists, and clinical researchers in a race for therapeutics, diagnostic tools, and TB prevention strategies. Barry's lab has made remarkable strides in understanding the mechanism of action of anti-TB agents. His TBRS has the distinction of being the most highly cited research group in the world in the field of TB over the last 10 years. Come and learn from the best and, as always, be prepared to be dazzled and demystified. Demystifying Medicine lecture, "Fungus Infections: Neglected, Dangerous and Increasing," by Arturo Casadevall, MD, PhD (JHU) and Michail Lionakis MD, ScD (NIAID) on January 29 from 4:00 p.m. to 5:30 p.m. in the Building 50 Conference Room. With viral and bacterial disease outbreaks such as Ebola, Zika, and listeriosis dominating the headlines, deadly and common fungal diseases such as candidiasis and aspergillosis have nearly fallen out of public health discussions. Yet fungal infections cause more than a million deaths per year, almost as much as tuberculosis, and contribute to blindness, asthma, and other serious health concerns. Among the deadliest is cryptococcal meningitis, a brain infection caused by the soil-dwelling fungus Cryptococcus. More than 220,000 new cases of cryptococcal meningitis occur each year, resulting in 181,000 deaths, according to the CDC. As worrisome is the rise of multidrug-resistant Aspergillus fumigatus, with a mortality rate exceeding 50 percent, and Candida auris, an emerging yeast strain causing healthcare-associated infections. Fungal infections are now a major cause of morbidity and mortality in immunosuppressed and critically ill patients. And such infections are expected to become more prevalent as the earth's climate warms. For this next lecture in the Demystifying Medicine series, we bring you two leading experts on fungal infections. Arturo Casadevall, a Bloomberg Distinguished Professor of Molecular Microbiology, Immunology, and Infectious Diseases at the Johns Hopkins Bloomberg School of Public Health, has defined much of what we understand about fungal pathogenesis and how fungi evade the host immune response. Casadevall also has posited a fascinating theory that fungi contributed to the fall of the dinosaurs. Michail Lionakis, chief of NIAID's Fungal Pathogenesis Section, has focused on the yeast Candida. His lab uses in-vitro cell culture systems and clinically relevant mouse models of mucosal and systemic Candida infections to study host-fungal interactions using a variety of immunological, biological, and imaging approaches. A major focus of his laboratory is the immunological mechanisms that account for central nervous system-targeted susceptibility to systemic candidiasis and other systemic fungal infections in patients with CARD9 mutations. This lecture will also be available live and archived via NIH Videocast at https://videocast.nih.gov. Please join us for the next Demystifying Medicine lecture, "Exploring Deep Sea Ecosystems and Human Disease," by Stefan Sievert, Ph.D. (Woods Hole) and John Dekker, M.D., Ph.D. (NIAID), on February 5 from 4:00 p.m. to 5:30 p.m. in Wilson Hall (Building 1/3rd Floor). Take a voyage with us into the deep. Stefan Sievert, a microbial oceanographer at the Woods Hole Oceanographic Institution, will provide a glimpse into the harsh and bizarre world at the bottom of the ocean - where life survives without sunlight and under pressure high enough to crush the metal submersibles sent there to explore. In what could constitute as an extreme biopsy, Sievert has been among the first to collect microbial samples from the very bottom of the sea floor and below. His treasure-trove haul is providing an understanding of the diversity and function of microbial life in the oceans and its implication for both health and disease in all species above, including us landlubbers. Coming up for air, we then will hear from John Dekker, chief of NIAID's Bacterial Pathogenesis and Antimicrobial Resistance Unit. Dekker studies extremophiles of our own making in the form of microbes grown resistant to antibiotics. He uses genomic techniques to understand the evolutionary mechanisms by which resistance emerges in this natural context; and his talk will focus on next-generation sequencing for infectious disease diagnostics, including metagenomic and nanopore-based approaches. Don your Jacques Cousteau cap and, as always, be prepared to be dazzled and demystified. Please join us for the next Demystifying Medicine lecture, "Hepatocellular Cancer: Progress in a Devastating Disease," by Marc Ghany, M.D. (NIDDK) and Anuradha Budhu, Ph.D. (NCI) on February 12 from 4:00 p.m. to 5:30 p.m. in the Building 50 Conference Room. Hepatocellular cancer (HCC) is a lesson in contradictions: preventable yet pervasive; described simultaneously as both rare and common; and among the deadliest of cancers despite the liver's regenerative properties. HCC is the most common primary malignant liver tumor and the third most common cause of cancer deaths worldwide. HCC is categorized as a rare disease in the United States, although that may change, as the yearly incidence rate of six new cases per every 100,000 people reflects a threefold increase over the past two decades, according to the CDC. This rise in U.S. cases runs parallel to increases in chronic hepatitis C virus and non-alcoholic steatohepatitis (NASH). Worldwide, the primary underlying case is hepatitis B and exposure to foodborne aflatoxins. For this next lecture in the Demystifying Medicine series, we bring you two experts on HCC. Marc Ghany, in NIDDK's Liver Diseases Branch, focuses on the care of patient volunteers in the NIH Clinical Center with chronic viral hepatitis and the prevention of HCC, cirrhosis, and other liver diseases. His latest research is revealing how innate immunity may contribute to clearance of hepatitis C virus during direct-acting antiviral (DAA) therapy by preventing the emergence of resistance-associated substitutions that lead to viral breakthrough. 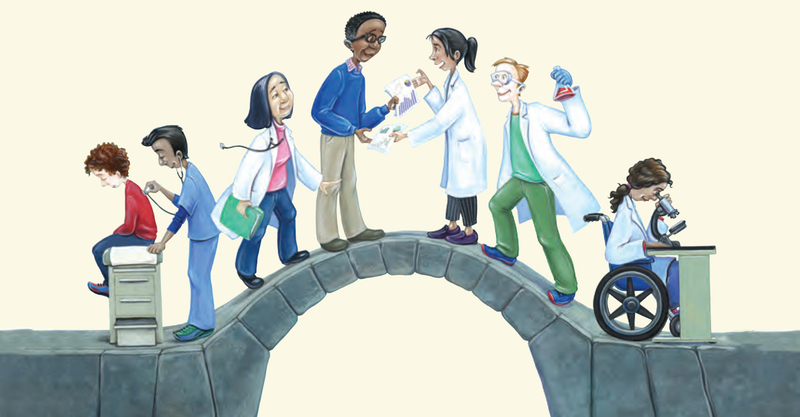 Taking the bridge to the bench, we then hear from Anuradha Budhu in the NCI CCR Laboratory of Human Carcinogenesis. Budhu's research focuses on genome-scale analyses of human liver cancer. Her work on gene, microRNA, and metabolite profiling has led to the identification of important signaling molecules that underlie liver cancer biology, with applications to the clinical management of liver cancer. Please join us for the next Demystifying Medicine lecture, "Mount Everest and K2: Too Little and Too Much Oxygen," by Louis Reichardt, PhD (Simons Foundation) and Toren Finkel MD, PhD (University of Pittsburgh) on February 19 from 4:00 p.m. to 5:30 p.m. in the Building 50 Conference Room. The air is free, as is this lecture. Approximately 2 billion years ago, a poisonous gas emerged on Earth that wiped out most organisms and sent others deep underground. That gas was oxygen, O2, and within a geological wink of an eye, through processes poorly understood, oxygen gas levels rose from near zero to 20 percent of the atmosphere. The freely available oxygen gave way to the evolution of most visible life seen today. Yet while oxygen is crucial for human life, too much will kill you. Breathing 100-percent oxygen for long periods damages the lungs and brain; and aging itself may be the result of slow oxygen poisoning, better known as oxidation and free-radical formation. For this next lecture in the Demystifying Medicine series, we bring you speakers who have seen the dangers of too little and too much oxygen. Mountaineer-scientist Louis Reichardt is the first American to have reached the summits of both Mt. Everest and K2 (only 200 meters shorter than Everest). Reichardt will present first-hand accounts of climbing without supplemental oxygen above the "death zone" of 8,000 meters and the subsequent risk of hallucinations, blurred vision, and loss of bodily functions. Then we hear from our old friend Toren Finkel, who left the NIH in 2017 to become the director of the University of Pittsburgh Aging Institute. Finkel studies how oxygen metabolism, mitochondrial function, and autophagy regulate mammalian aging. His lab also is developing novel small molecules that may slow or even reverse aspects of aging and may therefore be of benefit for treating a wide array of age-related diseases. Please join us for the next Demystifying Medicine lecture, "Cellular Immunotherapy of Cancer," by Steven Rosenberg, MD, PhD (NCI) and Nirali Shah, MD, MHSc (NCI) on February 26 from 4:00 p.m. to 5:30 p.m. in the Building 50 Conference Room. Immunotherapy has joined the arsenal of chemotherapy, radiation and surgery to manage cancer, having shown to be effective in the regression of metastatic cancer in patients with melanoma, sarcomas, and lymphomas. Much of the advances in cancer immunotherapy and related gene therapies were pioneered right here at the NIH under the leadership of Steve Rosenberg, chief of the NCI Surgery Branch. Rosenberg introduced the first immunotherapy treatment, interleukin 2 (IL-2), more than 30 years ago. He also spurred the development of a treatment approach known as adoptive cell transfer (ACT), which uses the body's own T cells to recognize and attack cancer cells. He was then the first to use T lymphocytes genetically engineered to express a chimeric antigen receptor (CAR) to successfully treat patients with aggressive lymphomas. In 2017, the FDA approved the first CAR T-cell therapies for children and young adults with a form of acute lymphoblastic leukemia (ALL), and then for adults with advanced lymphomas. For this next lecture in the Demystifying Medicine series, we bring you the present and future of cancer immunotherapy. Steve Rosenberg and Nirali Shah, clinical head of the pediatric hematologic malignancies section of the NCI Pediatric Oncology Branch, will describe both the remarkable cures and stubborn challenges they witness daily in immunotherapy clinical trials at the NIH Clinical Center. Rosenberg's own lab and others mentored by him are working on approaches to apply cell-transfer immunotherapy for patients with any type of cancer, such as solid tumors. Please join us for the next Demystifying Medicine lecture, "Machine Learning and Artificial Intelligence in Radiology," by Ronald Summers, M.D., Ph.D. (CC) and Baris Turkbey, M.D. (NCI) on March 12 from 4:00 p.m. to 5:30 p.m. in the Building 50 Conference Room. CME credit is available. Robots don't write these Demystifying Medicine messages, but they may in the near future...with fewer grammatical errors. Artificial intelligence (AI), machine learning (ML), and deep learning (DL) are poised to master mundane and rote tasks and perform them with efficiencies far greater than what can be done by humans. AI refers to computerized tasks that have elements of human smartness, or decision-making, as opposed to raw computing and number-crunching; ML is a subset of AI in which the computer system learns new tasks without additional programming. DL is ML on computer steroids, utilizing powerful computers and massive datasets to deduce features in the data and to establish and then refine computational rules to identify objects. For this next lecture in the Demystifying Medicine series, we bring you two speakers who are using AI, ML, and DL in a clinical setting to save lives and enhance patient safety and care. Ron Summers is chief of the Clinical Center's Clinical Image Processing Service and directs the Imaging Biomarkers and Computer-Aided Diagnosis Laboratory. Among many accomplishments, his group has applied DI techniques to create a dataset of 120,000 anonymized chest X-rays that researchers worldwide now can use to identify disease and abnormalities in their own patients' X-rays. Co-presenter Baris Turkbey, a physician in the NCI Molecular Imaging Program is applying similar technology to the field of prostate cancer, in which imaging has been a challenging task because of the high variability of the prostate anatomic structure. The robots are rapidly outperforming the human experts in identifying abnormalities reviewed by the imaging! Please join us for the next Demystifying Medicine lecture, "Inheritable Cancer," by Marston Linehan, MD (NCI-CCR) and Sharon Savage, MD (NCI-DCEG) on March 19 from 4:00 p.m. to 5:30 p.m. in the Building 50 Conference Room. Cancer development often is a result of environmental factors, such as exposure to tobacco products and industrial toxins. Other times, however, cancer is written in the cards, nearly unavoidable, arising almost solely from genetic factors. These are so-called "inheritable cancers," and common types include cancers of the kidney, colon, and breast. Of course, what is inherited is a gene defect from a parent, not the cancer itself. Upwards of 10 percent of cancers may be the result of such inheritable mutations. For this next lecture in the Demystifying Medicine series, now fortified with CME, we bring you two speakers who are investigating inheritable cancers from a clinical and epidemiological perspective. Marston Linehan, chief of the NCI CCR Urologic Oncology Branch, pioneered the study of the genetic basis of kidney cancer. His team identified the genes for the common forms of kidney cancer and described the pathways of these kidney cancer genes. His recent studies targeting the metabolic basis of kidney cancer have resulted in the regression of metastatic cancer in patients with type 1 and type 2 papillary kidney cancer. Co-presenter Sharon Savage, DCEG Clinical Director and chief of the Clinical Genetics Branch, has studied the genetic and molecular epidemiology of telomere biology, pediatric cancer etiology, and autosomal-dominant cancer predisposition syndromes, such as Li-Fraumeni syndrome. She and her team are characterizing the clinical consequences of these disorders and are developing cancer screening programs. Please join us for the next Demystifying Medicine lecture, "Losing and Regaining Hearing: From Humans to Zebrafish", by Shawn Burgess, PhD (NHGRI) and Andrew Griffith, MD, PhD (NIDCD) on March 26 from 4:00 p.m. to 5:30 p.m. in the Building 50 Conference Room. As described by Helen Kellar: "Blindness cuts us off from things, but deafness cuts us off from people," Hearing loss is a result of acquired events, such as infection, drugs, aging, environmental toxins and exposure to load noises (ie BOOMBOX Events) and others. In rare cases, hearing loss results from congenital or inherited defects. With an aging population, hearing loss continues to increase dramatically. Shawn Burgess,PhD, Senior Investigator in the HGRI, uses a systematic genetic approach with CRISPR and other techniques in zebrafish to understand hearing by knocking out all genes linked to human deafness, and investigating regeneration of hearing components. Come and learn from the best and, as always, be prepared to HEAR and be dazzled and demystified. Please join us for the next Demystifying Medicine lecture, "Premature and Unusual Causes of Coronary Heart Disease," by Douglas Rosing, M.D. (NHLBI) and Manfred Boehm, M.D. (NHLBI) on April 16 from 4:00 p.m. to 5:30 p.m. in the Building 50 Conference Room. CME credit is available. Coronary heart disease is the most common cause of death worldwide, comprising nearly 16 percent of all deaths annual. While many risk factors are known - aging, smoking, poor diet, lack of exercise - in some cases, the etiology often remains a mystery. More worrisome is the increasing presence of the disease in younger populations, with injury to the inner layer of a coronary artery sometimes manifesting itself as early as childhood. For this next lecture in the Demystifying Medicine series, we bring you two speakers who are providing new insights into Coronary heart disease by studying unique patient populations at the NIH Clinical Center, such as patients with rare monogenetic vascular diseases. Douglas Rosing is head of the NHLBI Cardiac Consultation Service. Manfred Boehm is a senior investigator in the NHLBI Laboratory of Cardiovascular Regenerative Medicine. Together they conduct research on clinically relevant questions focused on vascular injury, remodeling, and repair with the goal of translating research findings into new therapeutic strategies. Rosing and Boehm have absolutely fascinating cases to present. Come and learn from the best and, as always, be prepared to be dazzled and demystified. This lecture also will be available via live and archived at NIH Videocast at https://videocast.nih.gov. And don't forget the CME credit availability, new this season. The Demystifying Medicine Lecture Series is designed to help bridge the gap between advances in biology and their applications to major human diseases. The lectures include presentations of patients, pathology, diagnosis, and therapy in the context of major diseases and current research. All clinicians, trainees including fellows, medical students, Ph.D. students, and other healthcare and research professionals are welcome to attend. For more information, please visit the Demystifying Medicine website at https://demystifyingmedicine.od.nih.gov. Sign language interpreters can be provided. Individuals with disabilities who need reasonable accommodation to participate in this event should contact Dr. Irwin Arias, irwin.arias@nih.gov, 301-402-8394 or the Federal Relay, 800-877-8339. Please join us for the next Demystifying Medicine lecture, "Autoimmunity: Basic and Clinical Advances and Challenges," by Ronald Germain, M.D., Ph.D. (NIAID) and James Katz, M.D. (NIAMS) on April 23 from 4:00 p.m. to 5:30 p.m. in the Building 50 conference room, first floor. CME credit is available. Autoimmunity refers to a system of immune responses gone awry, tantamount to an attack against the body's own healthy cells and tissues with painful and often fatal consequences. This enemy within manifests itself in myriad ways, from targeted attacks (e.g., rheumatoid arthritis leading to debilitating joint damage) to multi-organ incursions (e.g. lupus and its effect on lungs, kidneys, nerves, and blood cells). Upwards of 10 percent of Americans live with an autoimmune disease, making this the third most common disease category after cancer and heart disease. But who or what issues these ill-conceived orders to the immune system? And can the orders be intercepted or revoked? For this next and antepenultimate lecture in the Demystifying Medicine 2019 series, we bring you two speakers who are on the frontlines of the battle against autoimmune diseases. Ron Germain, an NIH Distinguished Investigator in the NIAID Lymphocyte Biology Section, has made numerous contributions to the understanding of the cell biology of antigen processing. His group has pioneered methods of intravital 2-photon imaging to provide real-time, high-resolution visualization of immune-cell dynamics in situ, in the battlefield. Co-presenter James Katz is the NIAMS Rheumatology Fellowship program director and the principal investigator for general arthritis protocols. Through the NIAMS Community Health Clinic, Katz has broadened the clinical exposure of NIAMS Rheumatology Fellows and has recruited patients from underrepresented groups with rheumatic diseases to better probe the etiology of rheumatoid arthritis, an ancient plague. Come and learn from the best and, as always, be prepared to be dazzled and demystified. This lecture also will be available via live and archived at NIH Videocast at https://videocast.nih.gov. And don't forget the CME credit availability, new this season. For questions about the course, please contact ariasi@mail.nih.gov. This web page was last modified on 19 April 2019. .